Queryable Earth. We formally announced our vision for Queryable Earth at TED: to index physical change on Earth and make it searchable. We released a beta version of Planet Analytics, a solution that leverages machine learning to transform our imagery into insights, and signed our first analytics customers. Moved offices! We moved, with a state-of-the-art manufacturing facility. At three times the size of our previous office, our new HQ lab in San Francisco brings many aspects of our business under one roof. Grew our executive Team. We made two hires to our executive team with Nathan Dickerman as Chief Commercial Officer and Brian Hernacki as SVP of Software Engineering & promoted James Mason to SVP of Space Systems. Agile aerospace. We continued to iterate on our spacecraft and launched a total of 38 satellites – 36 next-generation Doves and 2 SkySats – on 5 rockets and even closed out the year with 3 successful launches in just 30 days. Expanded our markets. We sold our data to existing and new markets. Highlight deals include: a multi-year deal with DowDuPont’s Granular for digital agriculture solutions; a purchase agreement with NASA to use our data for scientific evaluation; and our third deal with NGA. We partnered with Airbus to facilitate global distribution of remote sensing data, and bring new geospatial products to market & together we’re servicing the European Space Agency Copernicus Programme with high and medium resolution imagery over the continent. Doing good. Among many impact partnerships, two highlights include: a partnership with Paul G. Allen Philanthropies and leading scientists to map the world’s corals and a deal with the State of California to aid in disaster relief around the devastating California wildfires. Welcomed Boundless to the family. We acquired Boundless Spatial, Inc. (our third acquisition), a St. Louis-based geospatial software solutions company, to expand our business with the U.S. government and agriculture customers. In 2019, we’ll be scaling our business by adding new markets and rolling out analytics capabilities. We also have some exciting launches scheduled that will send fleets of next-generation hardware and software into space. 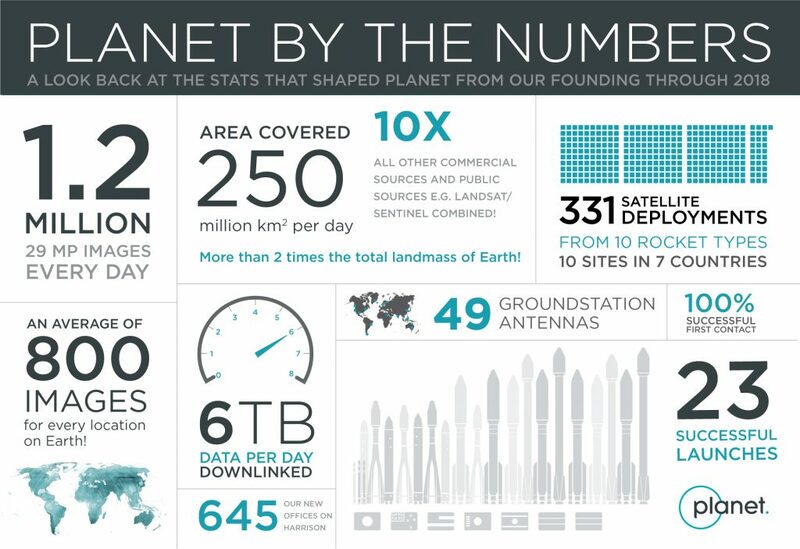 At Planet we’re building an audacious company at the intersection of space, hardware, software, and machine learning. We take extreme pride in the work we’re doing and we hope you’ll follow us on our journey into 2019, and beyond!